This matchmaker's mission is to hook you up...with a cab buddy. Fares from New York City airports into Manhattan can run $30 to $100, so why not let Hitchsters help you find someone else to split the tab. 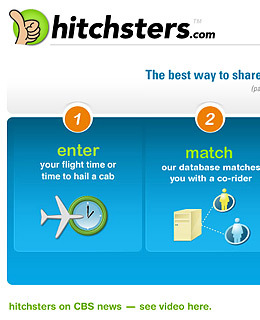 Simply input your flight time into the site's database, and Hitchsters will try to match you with a co-rider based on your preferences. Contact information is then given out to both parties, via email or text message, but don't worry: only a cell phone number and first name is revealed (the site doesn't even take addresses; users are asked to click on a map to indicate their general location). Co-riders work out a meet-up plan directly with each another. Hitchsters plans to expand into Brooklyn this summer, where it will connect riders with a car service (because it's much harder to hail a yellow cab in the outer boroughs) and then apply that new model to new services in other cities such as London and Boston. There are some etiquette guidelines. For instance, the first person to get out of the cab pays 60% of the fare. If you can't agree on who should get out first, then it's rock/paper/scissors. Hitchsters doesn't do background checks on its users, but neither does Craigslist, and besides, you've got the cab driver as a witness. And hey, you never know-that romantic ride back from LaGuardia just might turn into a first date.